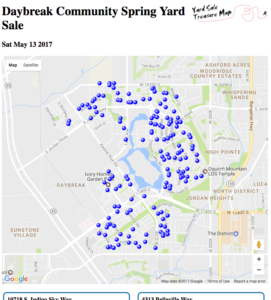 Holding a community yard sale is a great way to get noticed by hoards of yard sale hunters who are attracted to a high density treasure map. Buyers can visit more sales in less time while sellers get more visitors than they would probably see as an individual garage sale. it’s a win-win for both buyers and sellers! Don’t just post bulletin board flyers or rely on word of mouth. Take advantage of the free tools from Yard Sale Treasure Map to help you get the word out! 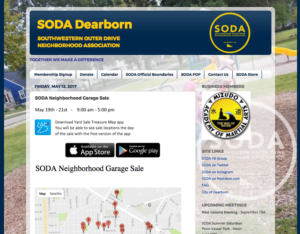 Because every community will organize and advertise their sale their own way, the following tools provide building blocks to help you communicate your community treasure map to buyers… the rest is up to you! After discussing the tools we’ll go over some examples of how different communities organized their sales to give you some inspiration. But first, let’s talk about what you, the community sale organizer, get from Yard Sale Treasure Map’s community sale tools. Visit this page to create your own community sale event. This creates your sale administration page. You will see a spreadsheet to add, update, or remove participating addresses along with a map showing a marker for each entered address. You may or may not receive an email with a link to this page for safe keeping, depending on your email spam filter settings. Bookmark this page! You can return whenever you like to make changes to your sale. Do not share this page! Anyone with access can change, or worse, remove your sales! Updates made here will be reflected in the Yard Sale Treasure Map apps for iOS and Android within a few hours, provided the sale is scheduled within the coming week. 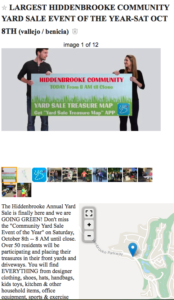 The Yard Sale Treasure Map apps allow text searches so that buyers can seek out that special item they’re looking for more easily. The description field allows you to enter information specific to each address so that a seller listing “Baby items” can be more easily found by an app user searching for the word “baby”, for instance. The descriptions are also visible when viewing sales in list view within the apps. Once all participating addresses have been added use the Distribution Tools to create media to share. Use the buttons on the left of your administration page to view the access the following webpages for your sale. Creates printable media. A map at the top has blue dots on each address with address and sale descriptions below. Creates printable media. A map at the top has numbered markers on each address with address and sale descriptions below. The markers can be re-ordered by dragging and dropping the markers on the map. For instance, if I want the number 5 marker to show number 1 instead I drag and drop the number 5 marker onto the number 1 marker (or drag the number 1 marker onto the number 5 marker… either way). This feature supports up to 99 sales because we can’t fit three digits on a map marker. The example community sale on the right has well over 100 participating address which makes the Numbered Guide inappropriate media for this sale to distribute, however smaller community sales may find this view more clear. 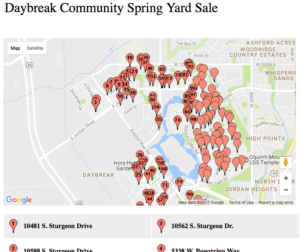 Here are some of our favorite examples of communities using Yard Sale Treasure Map to create an amazing sale experience! This sale put together a nice webpage on their association portal with information about the sale. They embedded the numbered guide directly into the page. The administrator also placed two app store buttons directly in the webpage to make it even easier for visitors to see how to download the app and prepare for shopping. This sale created an image describing how to access the apps and made this the primary image in their craigslist webpage. They copied and pasted the URL to their craigslist ad into the field at the top of their admin page so that app users see this detailed craigslist page when viewing participating addresses within the Yard Sale Treasure Map app. Of course the simplest solution of distributing the link to your interact-able google map (Live Example) may work just fine for you. 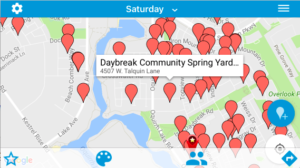 However you decide to plan your event, all users of the Yard Sale Treasure Map apps will see your sale during their weekend adventures so you will naturally receive extra visibility simply by filling out your administrator page spreadsheet.